MARS15 is a Monte Carlo code that simulates the passage of particles through matter. All types of particle interactions for hadrons, leptons, photons and heavy ions are included. Interaction and production cross-section modeling has been developed to match data, wherever such data is available, over a wide energy range. Accurate modeling is done in systems with complex 3D geometry and arbitrary materials and electromagnetic field distributions. 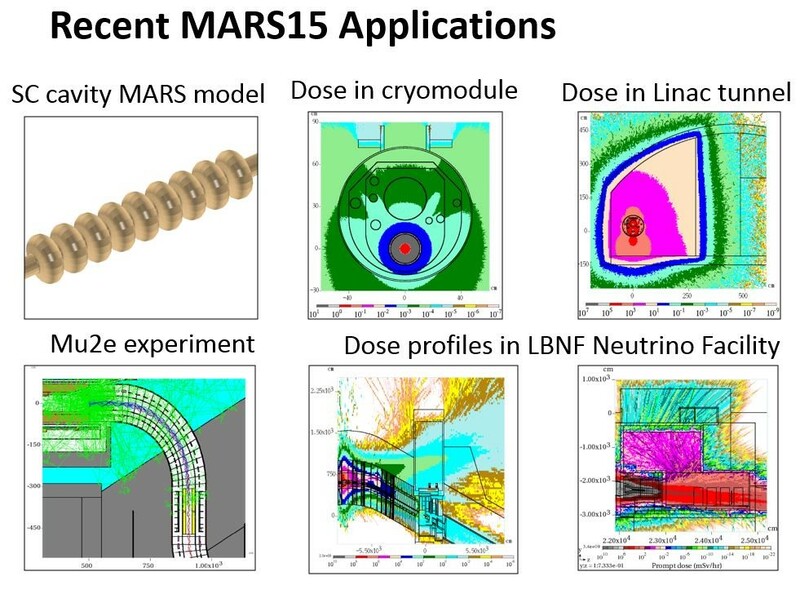 MARS15 has been developed over the past 4 decades, and is now widely used in the high-energy physics, accelerator, and radiation shielding communities. The code is under continuous development and benchmarked against new data as it becomes available, to maintain the simulation’s reliability and predictive power. The simulated particles are tracked through a user described geometry. The user’s geometry model can be very simple to very complex, incorporating compound materials of any shape and arbitrary magnetic and electric fields. MARS15 tabulates the particles passing through various portions of the geometry and produces results on particle fluxes, spectra, energy deposition, material activation, DPA, and many other quantities. The results are presented in tables, histograms, and other specialized formats. 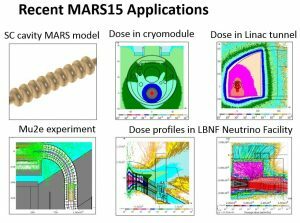 MARS15 allows the user extensive control over the simulated physics processes, over the tabulation criteria, and over runtime optimizations, via a variety of options and switches implemented from an input file and via customizable user subroutines. MARS15 is used to simulate electromagnetic and nuclear processes for applications in particle accelerators, radiation protection and dosimetry, radiation shielding, radiography, medical physics, nuclear criticality safety, detector design and analysis, oil well logging, and even particle cascades through spacecraft components.